Central Hudson Gas & Electric Corp. has awarded the Hudson Valley Advanced Manufacturing Center (HVAMC) at SUNY New Paltz a $200,000 Wired Innovation Centers grant to enhance the Center’s 3D metal printing capabilities, allowing HVAMC to perform high-resolution printing of wax components and direct metal printing, and acquire new post-processing equipment that makes it possible to create high-quality, final use parts. Central Hudson funding was contingent upon attracting matching contributions for the first $50,000 from the local manufacturing community. The SUNY New Paltz Foundation met the challenge with generous contributions from HVAMC clients and partners Selux Corporation, Zumtobel, ICL, Schatz Bearing Corporation, Ametek Rotron, Ducommun and ColorPage, as well as from New Paltz alumnus Ira Schreck ’74 and Foundation Board member Murali Chigurupati. The Center’s new metal printing and wax printing capabilities were initially supported by a 2018 award from the Dyson Foundation totaling $500,000. The new equipment will be installed in the Engineering Innovation Hub, the new home of the HVAMC, which is scheduled to open on the SUNY New Paltz campus later this year. The Engineering Innovation Hub is a new, state-of-the-art academic building made possible by a $10 million award from Governor Andrew Cuomo’s NYSUNY2020 grant program, which supports plans to improve economic development in New York State. The College was also awarded $1 million through the Governor’s Mid-Hudson Regional Economic Development Council’s annual Consolidated Funding Application. Central Hudson first partnered with the Hudson Valley Advanced Manufacturing Center at SUNY New Paltz in 2014, with an economic development grant of $250,000 to help establish a center for advanced manufacturing at the College. Central Hudson has been a consistent supporter of advanced manufacturing at the College in the years since. The HVAMC acts as a hub for innovation and a major production facility for companies seeking to print prototypes and manufactured items. Center staff provide expert advice on all aspects of the 3D printing process, making additive manufacturing accessible and realistic for regional businesses and community members. 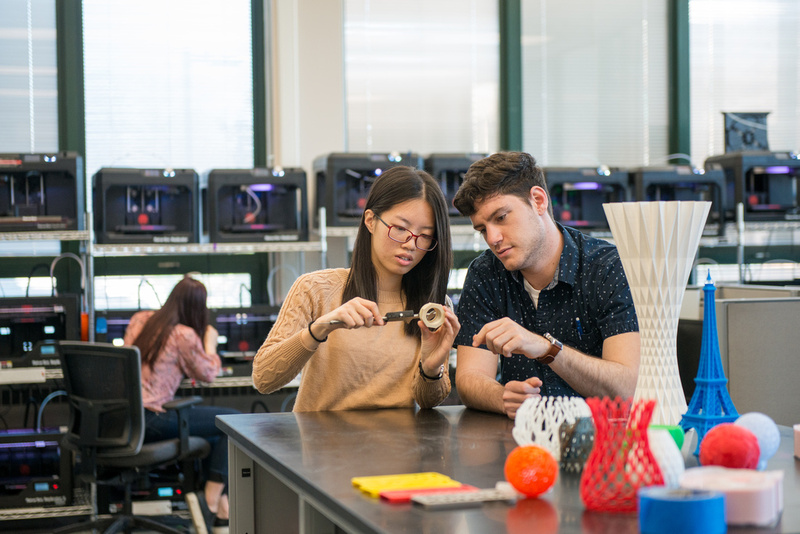 The Center supports the teaching of design in the arts, engineering and the College’s Digital Design and Fabrication minor by rapidly creating prototypes and consulting on materials and processes. Visit the HVAMC at SUNY New Paltz at https://www.newpaltz.edu/hvamc/ to learn more. Founded in 1976, the Foundation works to enrich the quality of academic life at SUNY New Paltz by raising private contributions. Gifts to the Foundation enhance the teaching, learning, and discovery that takes place on campus, and allow New Paltz to enrich the cultural, economic and social fabric of the Mid-Hudson region. There is virtually no activity on campus that does not benefit from the gifts made to the Foundation and to the endowment. One hundred percent of donated funds are used for programs that benefit students. For more information about the SUNY New Paltz Foundation, please visit http://www.newpaltz.edu/give/. Central Hudson’s Wired Innovation Centers grant is funded through the energy company’s Economic Development programs to help create the jobs of the future here in the Hudson Valley. Central Hudson offers a suite of economic development incentives to current and prospective businesses to help retain and develop new employment opportunities. For more information on Central Hudson’s Economic Development programs, visit www.CentralHudson.com/EconomicDevelopment.